Transferred by Michael T. Ryan, Director of the department of Special Collections, Van Pelt Library, August 17, 1995. Purchased by the Department of Special Collections from Carmen D. Valentino, a Philadelphia seller of rare books and manuscripts. This collection is organized in five series: Founding Documents and Membership, Minutes, Reports, Correspondence, Financial. Each series is arranged chronologically. The Phi Kappa Sigma fraternity was founded at the University of Pennsylvania in 1850 by Samuel Brown Wylie Mitchell, James Bayard Hodge, Alfred Victor du Pont, Charles Hare Hutchinson, John Thorn Stone, Duane Williams and Andrew Adams Ripka. These Pennsylvanians established the Alpha, or first chapter of the fraternity. For many years the Alpha Chapter was located at 3527 Locust Street, directly opposite the original buildings of the University’s West Philadelphia campus. The Alumni Chapter was founded in 1902 in order to provide financial assistance to the Alpha Chapter at the University as well as to foster continuing social relations among the Alumni Chapter members. The first annual meeting and banquet of the Alumni Chapter took place in 1903. 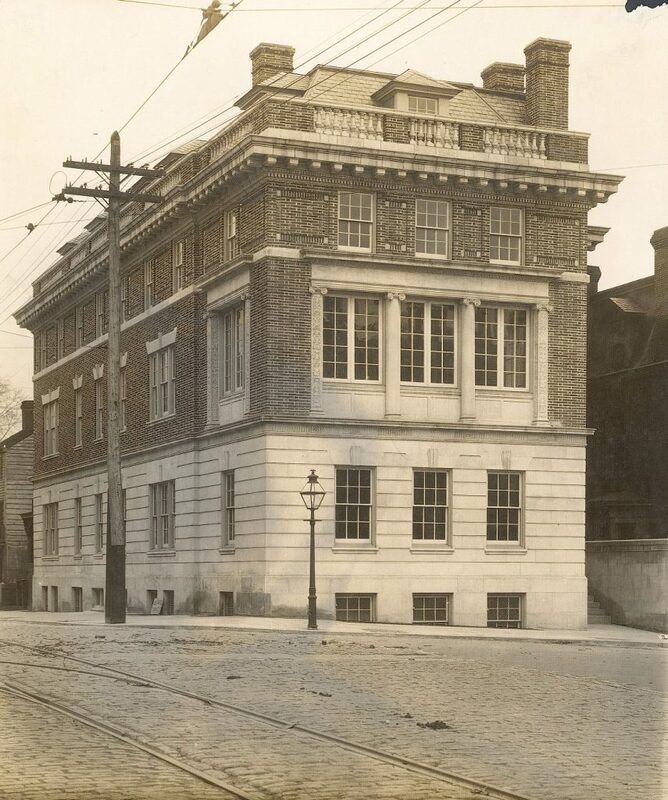 The Alumni Chapter was undoubtedly instrumental in fundraising for and the construction of a new Alpha Chapter house, completed in 1910 at 3539 Locust Street and still standing in 1995. The building was designed by the prominent Philadelphia architectural firm of Bissell & Sinkler and has been designated historically significant by the Philadelphia Historical Commission. This small collection documents the proceedings of annual meetings, many of which were held at the Philadelphia Gun Club, fundraising efforts, and subjects of interest to the Alumni Chapter of Phi Kappa Sigma including the renovations to the fraternity house and the fraternity’s involvement in World War I and World War II. Correspondence, meeting minutes, and other membership information highlight the activities of the alumni membership. Among those most active in the Alumni Chapter include Francis Gurney du Pont, E.P. duPont, Samuel T. Bodine, Hasletine Smith, Robeson L. Perot, George L. Justice, Charles S. Wood, W.F. Norris, Charles Wharton, Francis W. Sinkler, Thomas Reath, William Lippincott, Jasper Yeates Brinton, James B. Wharton, Cornelius N. Weygandt, Craig Sweeten, and T. Morris Perot.